Azure Cognitive Services are an amazing tool than enables developers to augment users’ experience using the power of machine-based intelligence. The API set is powerful and provides lots of features that are organized in categories: vision, speech, language, knowledge, search, and labs. In this post we learn how to leverage the Emotion API to get our user mood and set a background of our app accordingly. To get starded we need to get an API key to be able to access the Cognitive Services. 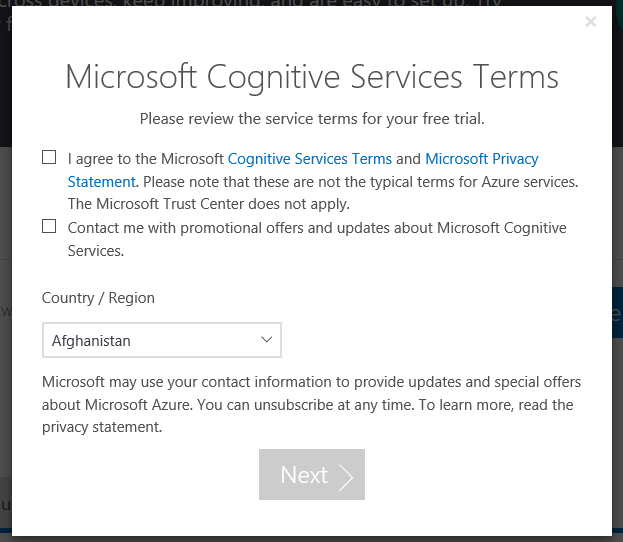 So, let’s go to this address (https://azure.microsoft.com/en-us/try/cognitive-services/?api=emotion-api) and click on the Create button next to Emotion API. Now we’re done with Azure web site and we can start coding. 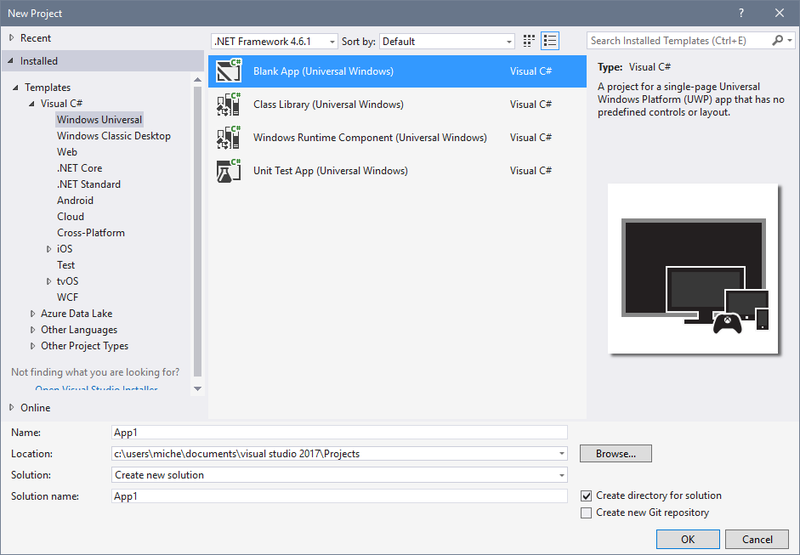 We fire up Visual Studio and create a new UWP project. To achieve our goal (get our user mood and change the background) where’re going to develop a simple UI where the user press a button, we take a picture of him/her, send that picture to Azure, and based on the result load a background image. Before we write code we need to setup our application capabilities in the manifest and download some NuGet packages. We double click on the Package.appxmanifest file in Solution Explorer and Visual Studio, go to the Capabilities tab and check the webcam and microphone boxes. Then we download the Microsoft.ProjectOxford.Emotion NuGet package that contains some helper classes to deal with the Azure Cognitive Services. In the Solution Explorer we right click and select Manage NuGet Packages. In the search box we type “Microsoft.ProjectOxford.Emotion”. We download the package. With the following XAML we draw a simple UI with a Button to trigger the camera. In this method we’re leverging the power of the MediaCapture class that provides functionality for capturing photos, audio, and videos from a capture device, such as a webcam. The InitializeAsync method, which initializes the MediaCapture object, must be called before we can start previewing or capturing from the device. InitializeAsync is a helper method we write to search for a camera and try to initialize it if we find one. Let’s focus on the MakeRequest method we called in the click event handler because here we make use of the Project Oxford library to detect emotions. We need to create an instance of the Microsoft.ProjectOxford.Emotion.EmotionServiceClient class. In the constructor we pass the key obtained from the Azure portal at the beginning of this post. Then, we call the RecognizeAsync method. Here we’re using the overload with the Stream parameter because we have our picture saved in memory. There is also an overload that accepts a URL string. With this call the Azure platform is now doing its magic and soon it’ll deliver the result. The RecognizeAsync returns an array of Emotion. An Emotion is made by a Rectagle reference and a Score reference. The Rectagle instance tells us the coorindates of the face detected while the Score instance tells us the confidence of every mood that Azure can detect: sadness, neutral, happiness, surprise, fear, and anger. Based on this data we can make “ifs” to do some funny things like changing the background of our main window. In this post we learned how to detect the current mood of our user. We achieved that by using our front camera to take a picture and then make a call to Azure Emotion API to guess if our user is happy or not. We had to set the app manifest to inform the OS that we need to use the Webcam to ask the user for the privacy settings. If you want to learn more about the MediaCapture class, visit MSDN (https://docs.microsoft.com/en-us/uwp/api/windows.media.capture.mediacapture) and the Azure Cognitive Services (https://azure.microsoft.com/en-us/services/cognitive-services/) website. The source code of the app developed in this post is available on my GitHub (https://github.com/phenixita/IC6.EmotionAPI). If you have questions you can use the comment section below or you can find me on Twitter! If you liked this post, share!